That is only one example. There are other ways that the site breaks down information. 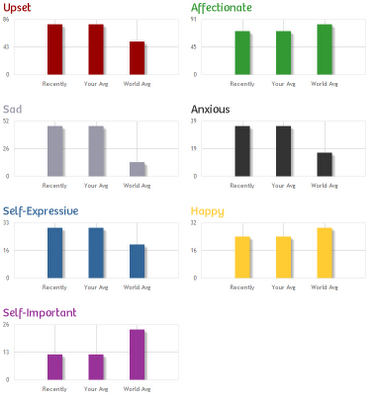 It also compares your emotions, concerns, word average, word usage, and mindset. So fascinating! This site is a great place to vent or to set professional writing goals. I joined with the hopes that daily writing will become second nature for me. Fortunately, the site lets you sign up to receive daily reminder emails, and every month a challenge is held. I joined October's writing challenge and signed the mini-contract that says if I write everyday of the month, then I'll treat myself to a chocolate mousse cake. Yum! Also, on the site, my name will be put on the "Wall of Awesomeness." How cool is that? However, if I don't write everyday, my punishment will be no new clothes for the whole month of November. Not even on Black Friday! And my name will be put on the "Wall of Shame." But I'm confident I can rise to the challenge. Can you? Of course you can. Come and check out the website and see if it's for you. I'm sure you'll love it! If you're interested in what else Buster Benson is cooking up, look at his other website called Health Month. I think that website you discovered is really amazing. It will help a lot of people out that need help in writing. Posting it was very helpful. I'm surprised 750 words didn't catch on. Thanks for the tip lady. Following you.